Stelvio Pass (Passo dello Stelvio, 2757 m) is one of the greatest passes in the world. It is located in the northwest part of Italian Alps, and it is the second highest in the Alps (after Col de l’Iseran, 2770 m). In this post, I give some important information about access roads and mountain climbing in the area. If you search the Internet for something like ’10 greatest roads in the world’, you cannot avoid getting to the Stelvio road. I have passed it several times and can say it is indescribable. So if you have a chance, do not miss it. 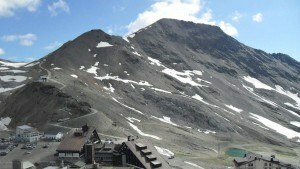 The north side of Stelvio pass. Web camera photo on the pass, May 2, 2015. The pass is closed in the winter time. But there is a camera directly at the pass so you can always see conditions there, throughout the year. When I was writing this text (May 2, 2015), I checked the link and the picture here shows what I saw, the pass was under the snow and obviously closed for public even in the mid-spring time. 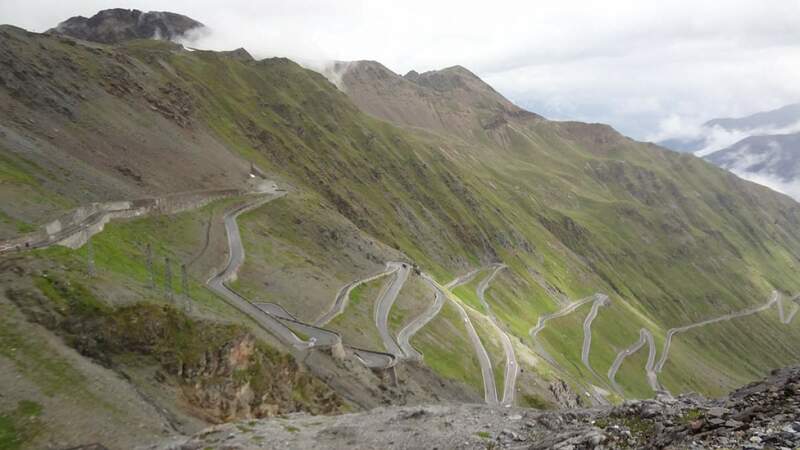 The Stelvio road has 75 turns, 48 of them on the north side and it is 49 kilometers long. The road connects Bormio in the south with Vinschgau valley, and farther with Austria, in the north. The road passes at a stone throw from the Swiss-Italian border. When you descend the pass towards Bormio, you will see border stones directly by the road on your right side. 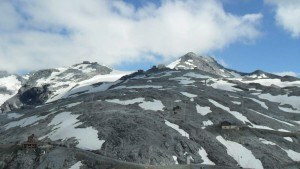 Garibaldi hut 200 meters above the pass. 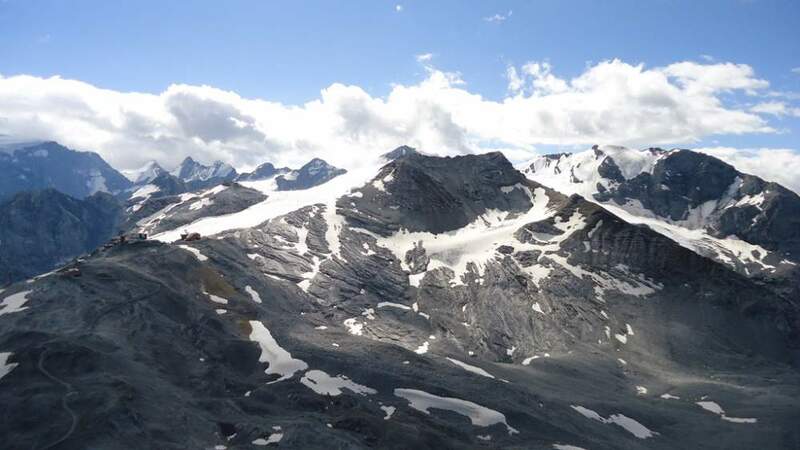 The border line above the pass comes to Dreisprachenspitze (2843 m), where you can spend a night in the Garibaldi hut. The hut is directly above the pass, some 200 meters short steep walk, you can see it in the photo here on the right, the building in the distance above the road. The name of the peak (which means ‘Three Language Peak’ describes the point where three regions meet, i.e., Lombardy, South Tirol, and Graubunden, with three languages, Italian, German, and Rhaeto-Roman (Romansch). The map pf the pass area. Below you may see a few photos which depict the beauty of the area. 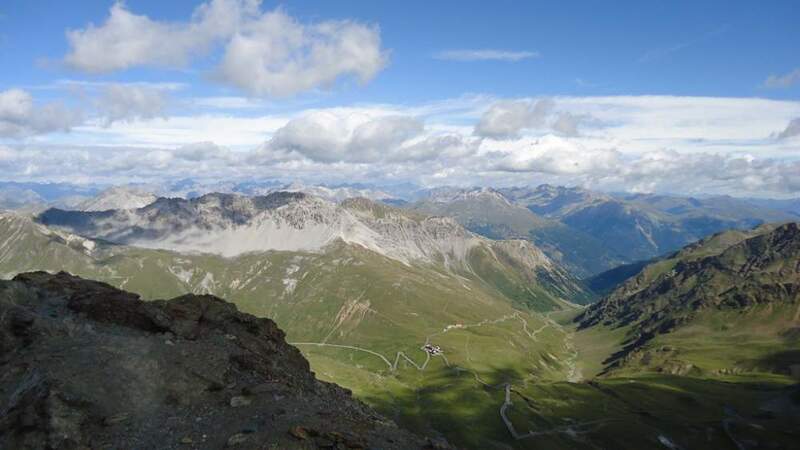 Stelvio pass as seen from Monte Scorluzo. The red mountain behind is Rötlspitz (3026 m). Tibet hut above the pass, Ortler in the background. The upper part pf the north side. Iani walking toward Garibaldi hut. Ivana at the pass before climbing Monte Scorluzzo, yes this is summer time. The road over the pass was built in the period 1820–1825 on the order of Austrian emperor. And the main engineer was Carlo Donegani. Later, Emperor Ferdinand awarded him the titles ‘Knight of the Austrian Empire’ and the ‘Nobleman of the Stelvio’. Italy is a beautiful country and it is full of great landmarks. I would say that Stelvio pass is one the greatest they have. Monte Scorluzzo (3095 m) above the pass. There are several nice mountains which you can climb from Stelvio pass within just a couple of hours. You will need no climbing equipment, except some sport or hiking shoes. The closest to the pass is definitely Monte Scorluzzo (3095 m). It is in the southwest direction, directly above the pass, you cannot miss it. You can climb it within 90-120 minutes from the pass. More details you can find if you follow the given link. 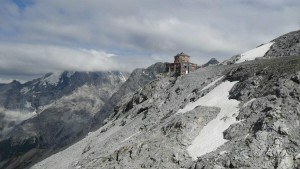 Next in the list is Roetlspitz (Rötlspitz; Punta Rosa, 3026 m) and you can climb it within 2 hours as well. You can see it in one of the pictures above. Piz Umbrail as seen from Monte Scorluzzo. Some maps show it as Piz Cotschen. The summit of the mountain is in the Swiss territory, in the north direction from the pass, so to get there you will be walking along the border in some sections (do not worry, there are no guards or passport control around, this is a past now). 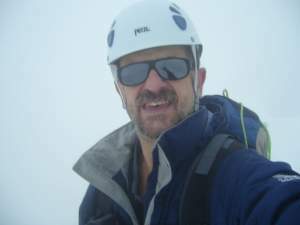 Yet another easy summit is Piz Umbrail (3033 m). To climb it you will descend from the Stelvio pass and go to slightly lower Umbrail pass (2505 m), just a few kilometers in the northwest direction. Details about the climb and the mountain you can find in this post within the site. Numerous peaks in the southeast direction: Punta del Naso, Hohe Schneide, Geisterspitze. 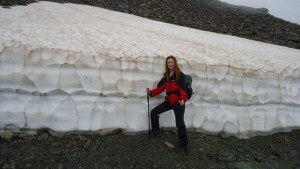 There are many more peaks which you can climb, but for those, you will need some equipment, like crampons and ice axe. These peaks are a bit more distant but still doable directly from the pass. They include the following: Hohe Schneide (Italian name Monte Cristallo, 3434 m), Punta del Naso (Grosse Nagler Spitze, 3272 m), Geisterspitze (Punta degli Spiriti, 3467 m), Payerspitze (3446 m), and Tucketspitze (3462 m). 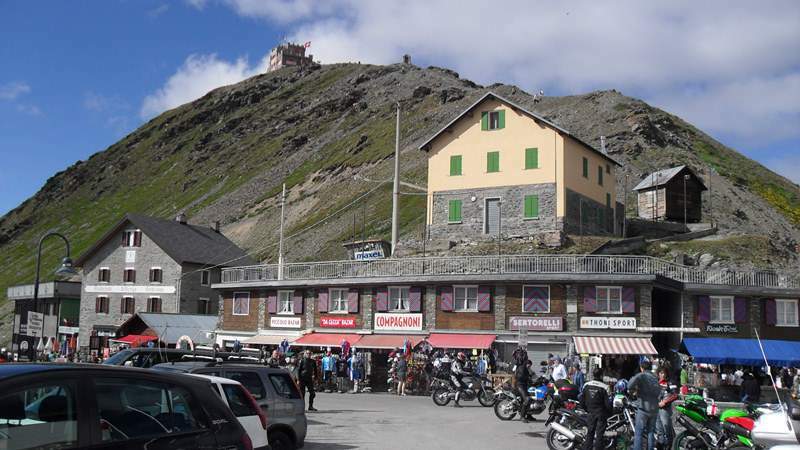 A convenient place to stay for the night is the Livrio hut (3174 m). 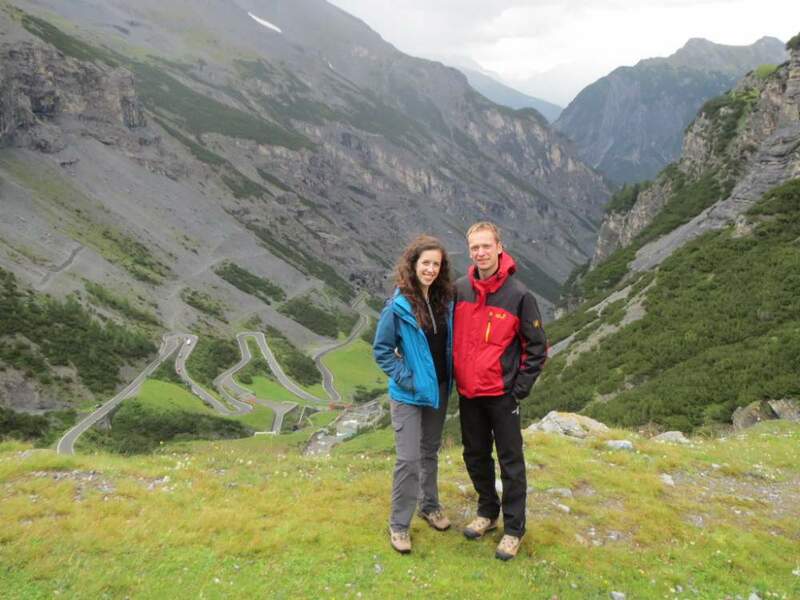 Jelena at Stelvio pass, the north side. View toward Geisterspitze from Garibaldi hut. The south side of the pass. Jelena and Tibor at the pass, the south side. Stelvio pass is a sacred mountain for cyclists, as some claim in the same manner as Mount Fuji is sacred for Japanese people. It was first crossed by the Giro in 1953, and the last time in 2014. Every year the pass is closed for vehicles for one day in August and thousands of cyclists cross the pass on that occasion. 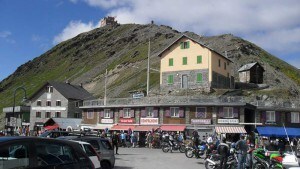 I already mentioned a few huts in the area (Garibaldi, Tibet, Livrio), but there are several hotels directly at the pass. This is a ski-area all the year around, therefore there are many places where you can stay. You can also rent flats and houses in all the valleys around. I hope you have enjoyed this text and photos. If you are in this area, do not miss the opportunity to visit Gavia pass which is only about 200 meters lower and it is also one of the greatest passes in the Alps. If you have any question please leave them in the comment box below. Hi Do. The length of the road from the two sides is very different. It is far longer from the Bormio side (South-West). I cannot tell you the actual length. I think I have seen some mini bus service on the North-East side road, do not remember seeing any taxi around but I am not sure. Yes, you can walk it from the valley, I have seen a few people coming from the valley to the peak of Punta Rosa which is higher that the Pass. Thanks a lot for your kind reply. I will walk from Bormio side, I have visa to Italy only. Do you think the road to the peak of the pass is safe for walking and walking is permitted? Is there snow in September? Thanks! Hi Do, I just passed Stelvio by car in both directions. Have seen people walking from the north side. Note, both sides are in Italy, but once on the pass you can stay in two countries with your two legs, there is nobody there to check. The south side is longer and you have several (probably 5) tunnels to pass and some are very narrow and unpleasant. 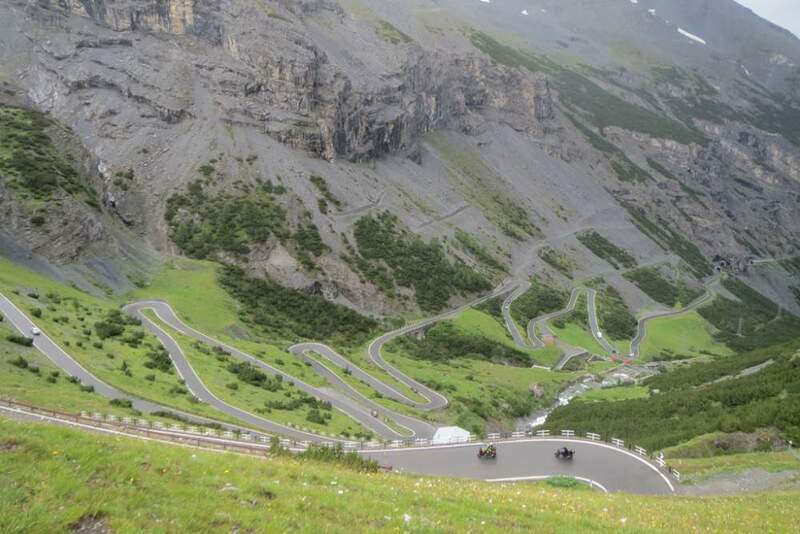 Oh my, the photo that you posted of the north side of Stelvio pass is absolutely breathtaking. I’m going to recommend this to my husband when we start planning our itinerary to Europe. We are both avid hikers, although we just started two years ago. Can you recommend a good tour or adventure company that can help us arrange this? Mountains are the best, love your posts, keep them coming! Thank you so much for sharing. Hi Julie, thank you. I have passed Stelvio at least 6 times so far and I am delighted every time. You do not need any tour organizer, just take a car and you will be there easily. Access roads are good from every side, easy to find. Indeed mountains are the best. What I really liked was all the pictures of mountains you had. Mountains are so awesome! I personally like to hike trails on mountains and I also like to rock climb. You have lots of good info on how to rock climb and when to do it. Overall it’s a great site. Many thanks Hyrum, great to read your comment, it gives inspiration to keep going. I think that I have come across this site quite a bit. Either this one or another one similar to this. Anyways, this site is great. From the pictures, to the videos to the 3D map of the actual mountains. amazing job and the way that all of the information is laid out is perfect. Thanks for the post. Thank you Chris, I hope you will have the chance to visit Stelvio, it is a great environment indeed, one of the greatest mountain roads in the world. Hi there, many thanks for visiting my site and for the comment. If you ever get a chance to visit this part of the Alps please do not miss it. You might want to see my another page about the nearby Gavia pass, which is almost at the same altitude and one of the greatest passes in the Alps. Another mountain, and another great article. I love to read your posts Jovo. Not being a mountain climber myself, I am living vicariously through you. However, I would love to drive up this road. It looks amazing.It also looks like a pretty tough climb on a bicycle….Do you know if the Giro de Italia or even the Tour de France have ever come through here? Hi Todd, thank you for reading my text. Yes, Giro d’Italia has a long history with both Stelvio and Gavia pass. I think it was first time in 1953 and many times after that, last time it was in 2014. Though these are extremely high passes and weather conditions may be very hard. Wow, you have just pushed my good button here! What a thing! I love every inch of the area. Few years ago, on my way to southern France, I took the pass road in Switzerland instead of freeway. It made my journey a few hours longer but every second of it was intense pleasure. 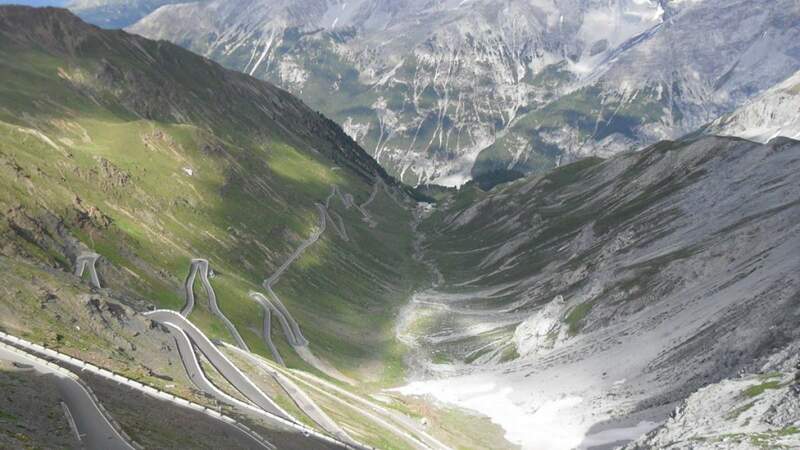 Pictures of Stelvio pass are just amazing and I`ll take the route as soon as I can. Thanks for the great article and for placing the link for the camera. Hi Igor, great to see how you feel about Stelvio pass. It is breathtaking for sure. If you happen to be there then do not miss Gavia pass, not less attractive. It is quite close. That is officially the scariest looking road I’ve ever seen. My stomach just dropped looking at it. Haha. Great article though, it was very in depth. I also love your use of photos and maps throughout. Hi Stu, thank you for the post. I passed a few times over Stelvio and I was excited every time. Everybody has fear of heights, this is natural. It is just how people cope with it. I see from your images that Stelvio pass is very beautiful. Have you hiked this pass more than once, or was this your first time? I used to hike a lot in the California Sierra Nevada’s, have you ever done any hiking there? I would love to hike the Stelvio Alps one day such a beautiful place. Hi David, thank you for the comment. 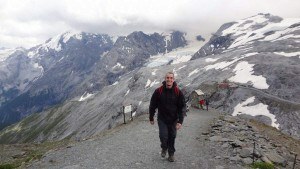 I did climb several peaks around Stelvio, like Piz Umbrail, Monte Scorluzzo, etc. As for California, unfortunately no, but I would like very much to do so. Great Article, I loved the pictures! I love going hiking up in the mountains as well but I do it less often then I would like to.. The stelvio pass is something I have heard of before and would really like to visit after seeing you blog post. I’m living in Asia at the moment so there’s quite a few mountains and volcanoes to climb, but I do really enjoy being in the Alps as well! The cold gives that extra sensation to it all. I do like to know a bit more of the difficulty of the treks? And which ones would you recommend doing? Hi Maarten, great to read you comment. There are many great peaks around Stelvio pass. I described some of them in my site. Like Monte Scorluzzo, Piz Umbrail and Rotllspitze. But the list is in fact very long. Absolutely amazing article! 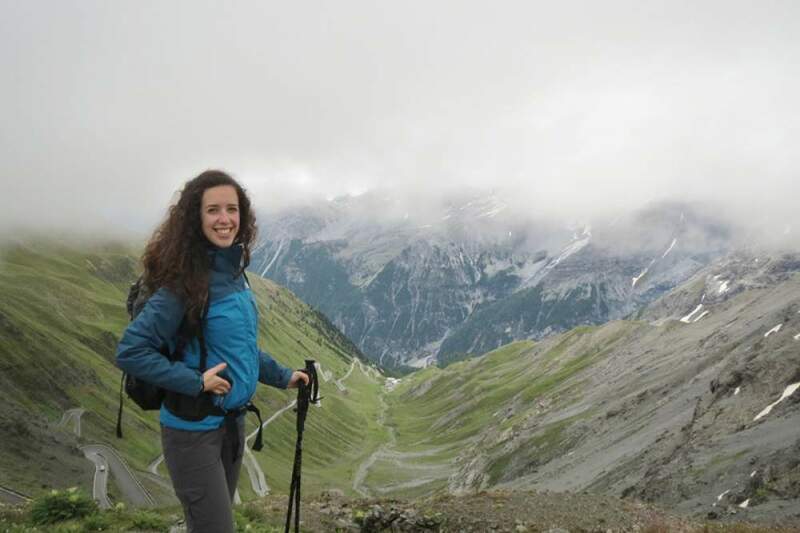 I love hiking and have been on many different trails throughout the world. I have not however been to the Italian Alps yet. This article has peeked my interest now. I may have to plan on a month trip and check this place out. It looks awesome! Very detailed article, loved all the pictures and the maps! Thank you John, great to read your comment and to realize that you like it. 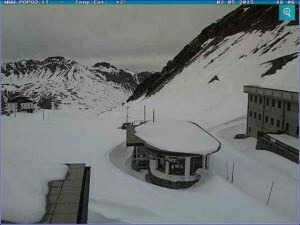 Best luck if you go to Stelvio and drive carefully. 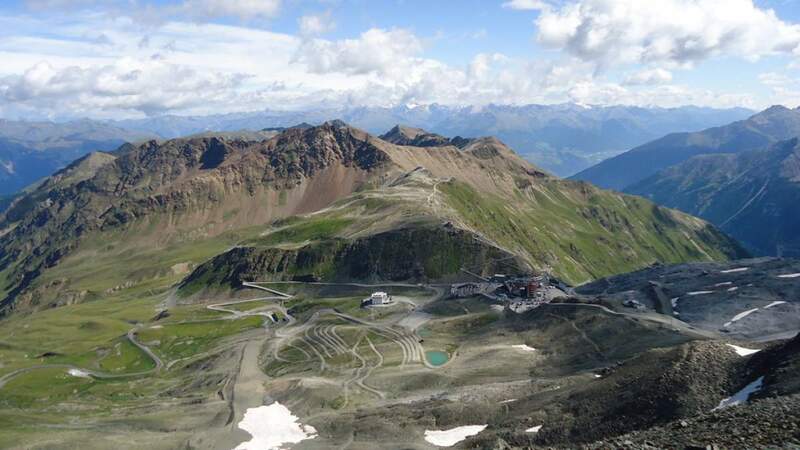 If you are there do not miss to visit Gavia pass which is nearby. I truly enjoyed every paragraph of this article and it really inspired me into doing another trip to Austria. I have gone by Car down there from Sweden a couple of times and I love it because I can choose my own roads, and I will most certainly choose the Stelvio pass for the next time! Thanks for providing great resources as maps, live web cam I didn’t know it was available to public and accomodation link. Makes it easier to plan a trekking trip in the Alps. I wonder if there is a best month to go for unexperienced people like me or if there are easy paths around Stelvio pass? Both have a sort of un-natural attraction, an extreme one, sometimes leading to insanity. When I’m there I simply cannot explain how I feel. I’m from Romania, we have mountains and seaside. If you ever need info from here, that you cannot find online (which is improbable) you can always ask me anything. I thoroughly enjoyed the article, photographs and video. I learned a great deal about another astonishing part of the earth. I love your website because it whisks me away momentarily and then I add it to my Bucket List! !